Back in January of last year, I spoke to you about the Colorado Ski Safety Act and the Colorado Court of Appeals case of Fleury v. Intrawest Winter Park Operation Corp. The Colorado Supreme Court decided to hear the case, and at the end of this May released their opinion in the matter. The Court held that ski resorts are not liable for the death or injuries to skiers who are hurt during an avalanche on a resort’s property because avalanches are an inherent risk of skiing. The issue presented in Fleury for the Colorado Supreme Court was whether an avalanche that occurs within the bounds of a ski resort qualifies as an “inherent danger and risk of skiing” under the Ski Safety Act of 1979. This issue is important because injuries sustained from inherent risks prevent skiers from bringing claims against ski area operators for those injuries. those dangers or conditions that are part of the sport of skiing, including changing weather conditions; snow conditions as they exist or may change, such as ice, hard pack, powder, packed powder, wind pack, corn, crust, slush, cut-up snow, and machine-made snow; surface or subsurface conditions such as bare spots, forest growth, rocks, stumps, streambeds, cliffs, extreme terrain, and trees, or other natural objects, and collisions with such natural objects; impact with lift towers, signs, posts, fences or enclosures, hydrants, water pipes, or other man-made structures and their components; variations in steepness or terrain, whether natural or as a result of slope design, snowmaking or grooming operations, including but not limited to roads, freestyle terrain, jumps, and catwalks or other terrain modifications; collisions with other skiers; and the failure of skiers to ski within their own abilities. (Emphasis added). The Court goes on to analyze what a “snow condition” is by simply looking at the dictionary definition of “condition,” which means “mode or state of being” or “the physical state.” In this case the physical state of snow. The Court then discusses how the statute contemplates that snow conditions “may change.” The Court reasons that one way a snow condition “may change” is through movement of the snow, in other words movement caused by gravity, and the results being an avalanche. The Court states that in the case of and avalanche, “snow conditions started with fresh snow on unstable snowpack, and, within moments, changed to a mound of snow at the bottom of the incline.” The Court holds that the movement of snow is “therefore a way in which snow conditions may change,” and thus C.R.S. § 33-44-103(3.5) covers in-bound avalanches. Two justices dissented in this case. The dissenting opinion focuses on the statutory construction of the Ski Safety Act. Justice Marquez, writing the dissenting opinion, opines that because the Act grants ski operators immunity for injuries sustained from the inherent risks of skiing, that we must construe the statute strictly—that is, strictly look at the words in the statute, not giving it a broader meaning. That also requires a look at the legislative history behind the statute. First, Marquez considers the term “including” within the statute. She opines that the term serves to limit the list of snow conditions instead of it being used as an expansive list. In a 1990 amendment to the Act the state legislature actually removed the language which stated that inherent dangers and risks of skiing are those dangers “including, but not limited to” and then lists the hazards. They struck the language and made it simply state “including” and then listing the hazards. Therefore, with this language Marquez reasons we must construe “inherent dangers and risks” narrowly, and not include avalanche. Furthermore, she opines that list of snow conditions “describes a physical property or quality of the snow itself.” Avalanche does not fall into this. Then, she goes on to state that an avalanche is an event, not a condition. The movement of snow is considered an event. 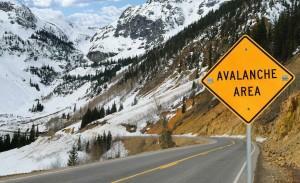 A condition of snow should not change the location of the snow; however, an avalanche certainly does change the location. The “change” in the condition of snow refers to a physical state or quality in her opinion, and avalanche does not qualify as that. In conclusion, Justice Marquez feels that while the Colorado General Assembly could have easily added avalanches to the list of inherent dangers and risks, that failed to do so; thus, there should be no immunity. Justice Marquez mentions in her dissenting opinion that other states have made a distinction in their statute that includes avalanche, which Colorado has not done. Specifically, Idaho made a distinction between conditions and movement of snow, so that inherent dangers and risks are “any movement of snow including, but not limited to, slides, sloughs or avalanches.” This is something that is clearly missing from our statute’s language. This Supreme Court decision means that ski operators are immune from suits involving injuries or death of skiers caused by an avalanche. This is of course a limited opinion, and there are still situations in which ski operators are liable for negligent actions. However, this means that a ski resort has no duty to provide skiers notice of the risks of avalanches on its property, even if the ski operator is aware of the dangers. That means skiers, you need to be proactive before you head out skiing, checking the weather report to see if there are any warnings concerning avalanches risks in the area where you wish to ski.